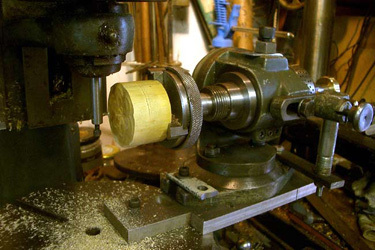 First efforts using my BCA jig mill as a cutter, a rotating indexer with a piece of hexagonal stock as a rosette, a method described by Steve Ellis in the SOT Journal. 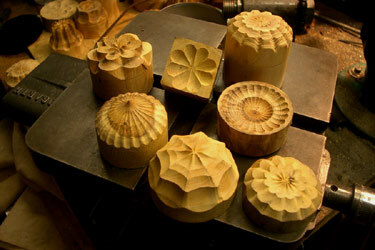 The sample pieces are boxwood & yew. 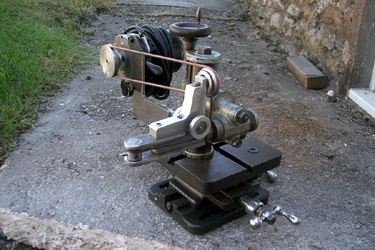 Hooked by the interesting patterns that can be made with this setup, I decided to make a proper cutting frame based on the design at ornamentalroseengine.com (to whom thanks are due) and a rocking & pumping mandrell. 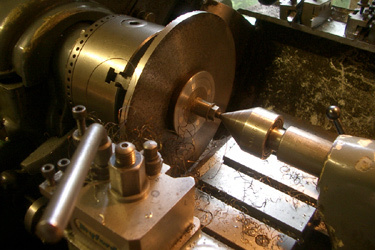 Finished cutting frame, mounted on a compound slide and utilising a Potts milling attachment for vertical adjustment. Progress so far on the rocking headstock. 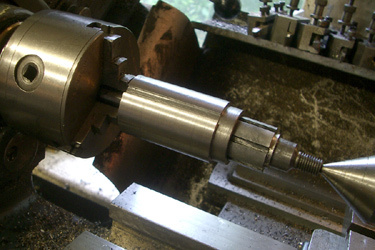 A small lathe countershaft/motor mount provided the bearing housings after giving it the good news with an angle grinder & cut-off wheel. 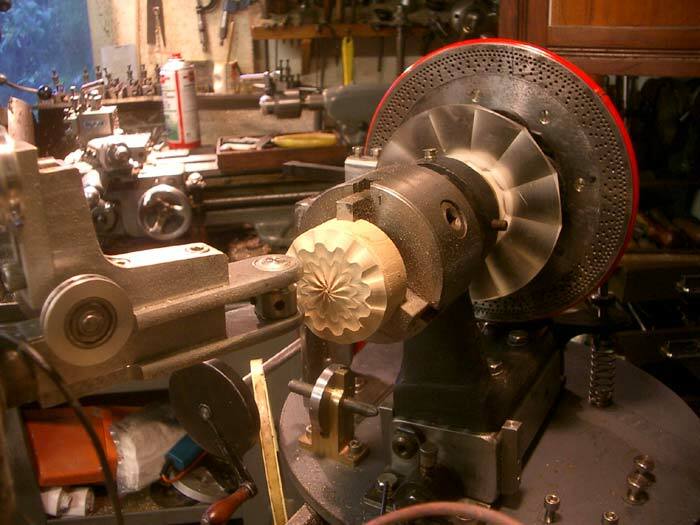 I removed the worn out ball bearings and turned up a pair of bronze bushes which will be more than adequate as rose engine mandrels don't turn that fast. 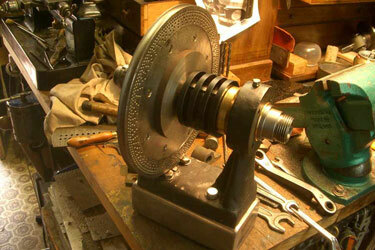 The mandrell is 1" diameter with a Myford thread to take my chucks & collets. 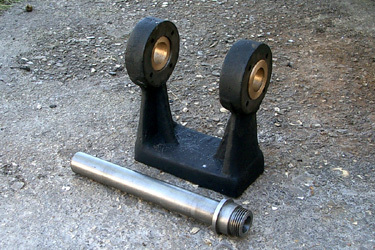 Headstock and mandrel. 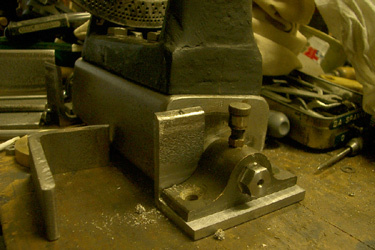 It will be bolted to the box section below which will hold the rocking bearings. 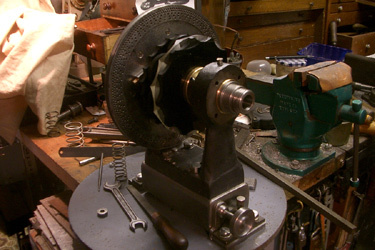 Turning the division plate (hacked from 3/16" plate with my trusty angle grinder), the smaller disc will hold grub screws to lock the disc to the mandrel. 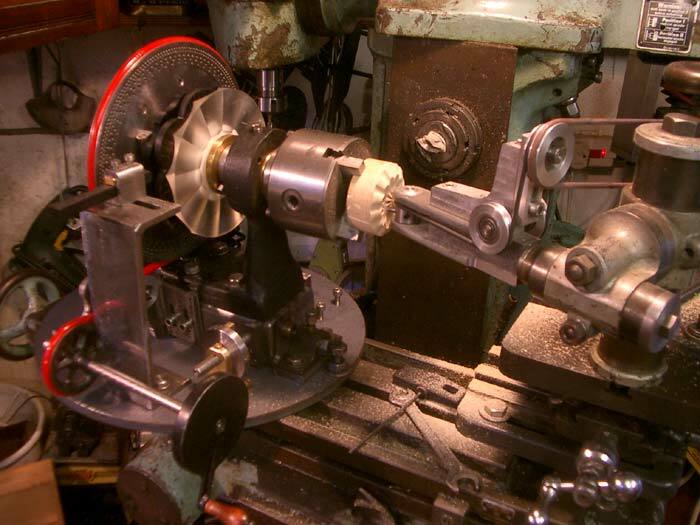 Lapping the rosette barrel for a sweet fit on the mandrel. 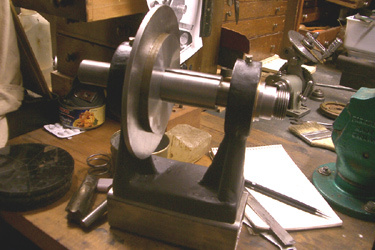 Trial assembly of mandrel, rosette barrel with phasing ring, & division plate. 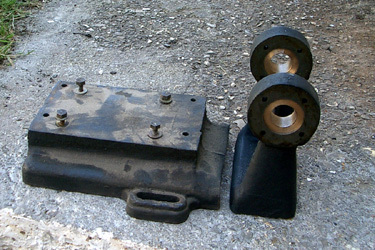 Finished division plate, rows:- 2 x 180; 96, 72 & 60. 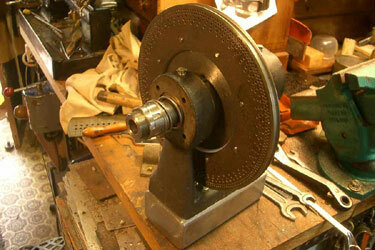 Originally I intended to mount the drive pulley on the rear of the mandrel, a better arangement is to have it between the bearings so when I came across an 8" x 3/8" disc of boilerplate in the scrap bin I decided to add this to the original division plate. 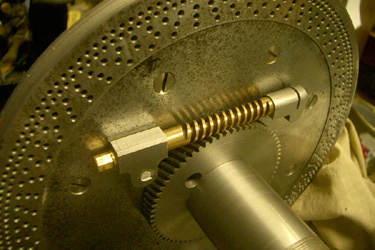 The 3/8" thickness allowed for the belt groove and also a greater diameter for the division holes. 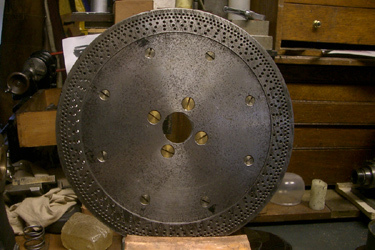 Even with the increased diameter it was not possible to fit 360 holes of any reasonable size so a second row of 180 holes were drilled offset by half a hole to the first row. 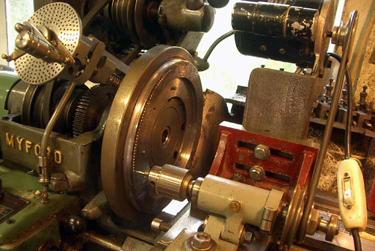 Further rows of 96, 72 & 60 holes were drilled. This may seem a bit of overkill but if I didn't have a good range of divisions Sod's Law would certainly indicate the need of them later. 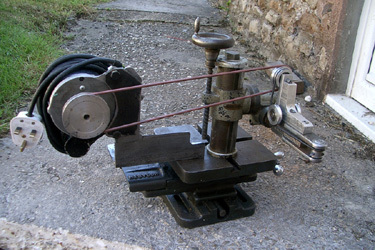 Another consideration is that by fitting a locking arrangement to the rocking headstock I would be able to use it as a simple OT lathe. 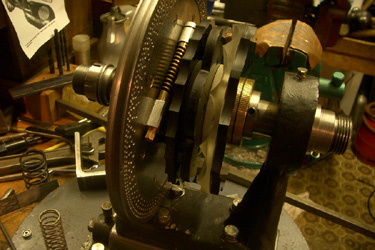 Rear of mandrel showing pumping spring & tensioner. 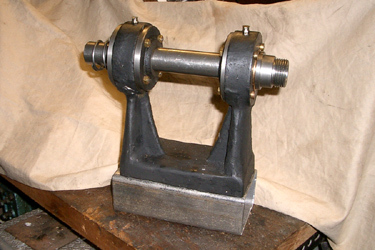 Rocking trunnions & bearings (complete with 'vintage'grease cups! 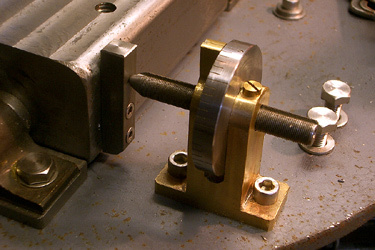 Trial assembly with rocking bearings bolted to base plate and locking pin fitted. 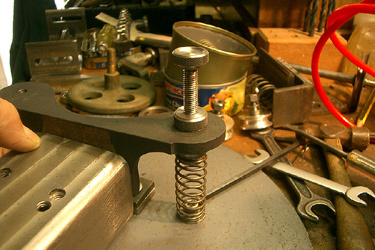 Spring bracket & tension adjuster.